A limited edition LOGSAC t-shirt for a cause is out now for sale. This is basically the club's strategy to generate funds for conservation and rehabilitation of Sibulan River as an offshoot to GASA SA SUBA Sibulan River Conservation Project. The t-shirt costs 165 each for LOGSAC members and 175 for non-members. Certain percentage of the proceeds will be used to purchase materials and other supplies for next year's LOGSAC Anniversary celebration Tree Growing at Sibulan River dated February 19, 2010. 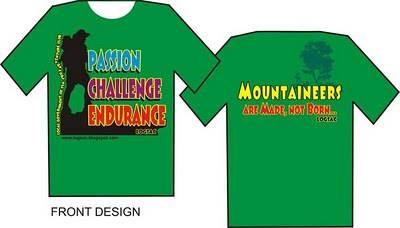 For orders, please contact Mr. Julius R. Paner thru Mobile Phone number 09208567991 or email at logsac_adventure@yahoo.com. Please indicate the sizes of your orders and also have it paid upon order.